Visual Acuity: Visual acuity is used to determine your current visual status. Refraction: An accurate refraction to determine the prescription needed to give clear, comfortable vision. Binocular Vision: An evaluation of binocular vision to assess eye-coordination, muscle balance, and focusing capacities. External Examination: We will perform an external examination of the lids, cornea, conjunctiva, and surrounding tissues. Internal Examination: An internal examination to inspect the retina and other tissues for glaucoma, macular degeneration, or any other abnormality, whether ocular or systemic, using a biomicroscope. We also have the latest retinal camera to capture high resolution images inside of your eyes, as well as Ocular Coherence Tomography (OCT) imaging to further aid in diagnosing complex disease conditions. Post-Examination Consultations: The findings will be discussed, recommendations will be given, and a decision on treatment will be made. It is well documented that diabetes is the leading cause of vision loss in younger Americans and that diabetic complications are often missed without a dilated evaluation. At Family Focus Eye Care, dilation of the eyes is an integral element to a diabetic eye exam. 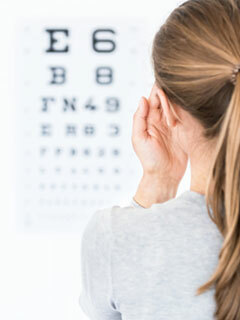 A summary of your eye examination will be sent annually to the endocrinologist and family doctor to maintain communication with contributing providers. It is important to remember that early signs of diabetic eye disease rarely produce visual symptoms and by the time a patient is aware of a visual problem it may be too late for full visual recovery. Our Doctors specialize in the professional fitting and dispensing of premium contact lenses. We provide the following modalities of contact lens service, which are all available to correct farsightedness, nearsightedness, astigmatism, and presbyopia (the need for reading glasses or bifocals), unless otherwise noted below. The doctors at Family Focus Eye Care provide Urgent Care eye service. Whether removing an ocular foreign body or treating conjunctivitis (pink eye), We can handle your emergency eye care needs. Our doctors are preferred providers for all local major health insurances including Blue Cross/Blue Shield, Health Alliance, Signa, Aetna, and United Health Care. All emergency visits are applied to the respective medical insurance, not vision insurance.